No, no! Undyne, you shouldn't grab people with skin and fur the same way you grab Papyrus! I relate with the beach one. I hate hot weather, also in the shower I hate it when the water is too hot or cold.
" can't spell FRISK without RISK"
Wow! Great Work! You must have put a lot of effort into these projects! Technically when this was created, the AU doesn't have a name, now this can be considered a part of Sibilingtale, or Endertale. These were so cute and funny! Calvin and Hobbes reference? No? Just me? "still can't name worth a darn"?? Also, was this the inspiration for Endertale? Seems to be a common theme with him in AU comics, I mean who doesn't want the happy ending to include fluffy goat boy? OH MY GOD, THAT CALVIN AND HOBBES REFERENCE WITH THE BEACH SEGMENT. Oh, when the kids nap it’s cute, but when Sans does it it’s annoying! Because sans' sleeps 99% of his life. Sketch dumps are best when hilarity ensues. 1: Asriel was actually inside the statue the whole time; Flowey is an imposter! 2: "Yeah. My sweater does." 3: That means you will have to learn to shave, son. 4: Papyrus as the only sane monster? Weird. 6: Those hot cats smell "purr-ty" good. 8: I recognize this Calvin and Hobbes strip! ...Shame on you, that's plagiarism. 10: There is no curfew; there is only anime. That one where they were at the beach... was that a Calvin and Hobbes reference? Asgore looks like Cousin It. This is so cuuuute!! Your killing me here! There is a Calvin and Hobbes Refrence in there somewhere... I know what it is, too. *gasp* OH MY GOD THE ONE WHERE THEY WERE AT THE BEACH IS A CALVIN AND HOBBES REFERENCE!!! 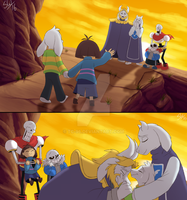 Hold up, So in that second - to - last Panel, Asriel is with Alphys meaning only one thing. they're watching anime. But that look in Asriel's eyes it's telling me more; it could only mean what they are watching is FATE:Apocrypha.